Giovanni Hidalgo has played a major role in shaping the way the world thinks about hand drumming, and has played LP exclusively for his entire career. Giovanni replicates sounds with his hands that drummers normally make with sticks. Ambidextrous, with faultless technical skills and superb musicality, he has created a style all his own. Giovanni’s LP product line includes the Palladium Congas, Compact Congas and Galaxy Congas seen on these pages, as well as bongos, timbales, djembes and bags. Giovanni adds his flair to LP's innovative Prestige Timbales. 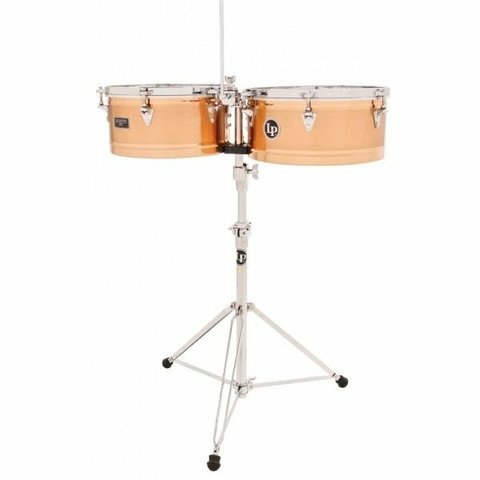 Now in an attractive satin and gloss finish, these bronze timbales have all the great features of the LP Prestige Timbales; top key tuning and wide rib placement for an expanded cascara playing area.